AppFabric is very much dependent on the .NET Framework 4 and uses many of the features provided by the framework such as monitoring, persistence, hosting of WCF and WF Services. AppFabric also integrates with IIS and provides management and monitoring tools from the IIS Console. 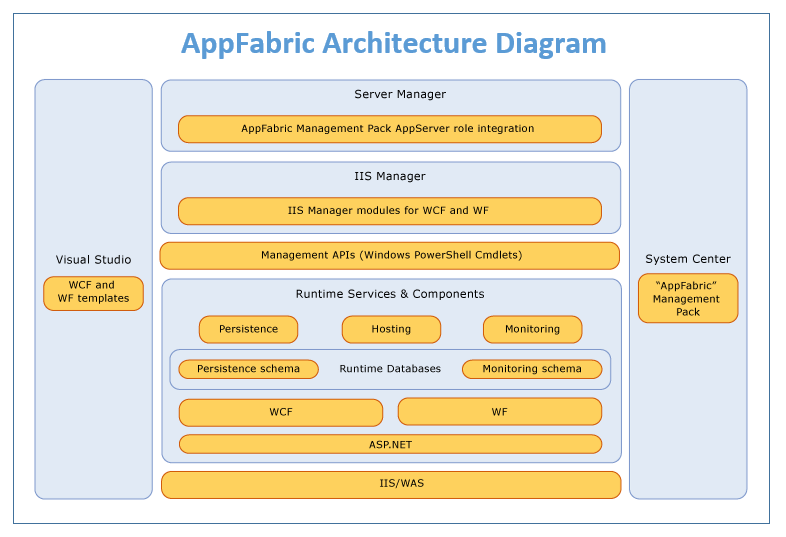 Here is an architectural diagram that shows AppFabric and its components and also the components of .Net Framework and IIS and how AppFabric uses them. IIS and WAS forms the foundation on which AppFabric is built. Message-based activation of applications that allows applications to start and stop dynamically in response to incoming messages. Robust application and worker process recycling to maintain the health of running applications. Organization of applications into sites for the purposes of addressing and management. At run time, applications are associated with application pools that define runtime process boundaries. AppFabric provides services, such as persisting the state of a long-running workflow to a persistence store, content-based routing, and configuration-based activation. AppFabric provides the following tools to Manage AppFabric and the WCF and WF Application services. An AppFabric Setup Wizard that you can use to install AppFabric, add features to or remove features from the AppFabric installation, or upgrade AppFabric. An AppFabric Configuration Wizard that you can use to configure AppFabric hosting and caching features. AppFabric IIS Manager extensions that you can use to manage applications built from WCF and/or WF services. Windows PowerShell cmdlets for AppFabric that you can use to perform management tasks on applications and services. You can do so interactively in the Windows PowerShell console, or script management tasks with cmdlets. These cmdlets provide the functionality behind much of the AppFabric application management UI.